alaTest has collected and analyzed 427 reviews of Lenovo IdeaPad K1 / Lenovo IdeaPad Tablet K1. The average rating for this product is 3.7/5, compared to an average rating of 4.3/5 for other products in the same category for all reviews. Opinions about the screen and durability are overall positive. The price and performance are also mentioned favorably. Some have doubts about the portability and reliability, and comments are divided on the apps. We analyzed user and expert ratings, product age and more factors. Compared to other products in the same category the Lenovo IdeaPad K1 / Lenovo IdeaPad Tablet K1 is awarded an overall alaScore™ of 87/100 = Very good quality. 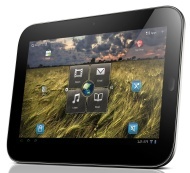 alaTest has collected and analyzed 165 user reviews of Lenovo IdeaPad K1 / Lenovo IdeaPad Tablet K1 from Amazon.com. The average user rating for this product is 3.4/5, compared to an average user rating of 4.1/5 for other products in the same category on Amazon.com. People are impressed by the screen and durability. The price and usability are also appreciated. There are some mixed comments about the camera, and some have doubts about the portability and reliability. 65% of the reviews on Amazon.com give this product a positive rating. The K1 is a bit too heavy and large for its own good, and Lenovo's Android modifications are a mixed bag, but there is nothing particularly offensive about the design, specs, or operation of the device. The K1's easy-to-use skin and useful apps make it an acceptable option for low-tech types, but geeks will likely demand faster performance and longer battery life. Lenovo's ; packs in all of the best features found in today's modern Honeycomb tablets (upgradeable to Android 4.0) and offers some unique Android optimizations and preloaded apps. The design is thick and heavy compared with the latest from Apple and Samsung, not all of the Android tweaks pay off, and the screen isn't as bright as it could be. Lenovo plays it safe with the IdeaPad K1, delivering a solid tablet that does little to stand out from the Honeycomb herd. With everyone trying to muscle into the tablet market, Lenovo's entry is a credible contender. Lenovo's IdeaPad K1 packs in all of the best features found in today's modern Honeycomb tablets (upgradeable to Android 4.0) and offers some unique Android optimizations and preloaded apps. The Lenovo IdeaPad Tablet K1 is as good as its Android Honeycomb tablet competition, but doesn't offer any game-changing differentiators that make it stand out in the ever-expanding tablet space. Fast performance. Good multimedia features. Clever button and camera layout. Physical Home button. Netflix is preloaded. Prone to crashes. Thick. Lots of bloatware. There was but one performance issue with the K1: In my tests, apps, along with the browser, crashed a number of times. Once, the tablet crashed completely and required a reboot, a problem I’ve never had with another Android tablet. First timer: Along with the X Series and ThinkPad Tablet, Lenovo's IdeaPad K1 is the company's first major salvo into the tablet marketplace. With a competitive price tag and strong features, the K1 is aimed straight towards casual users.